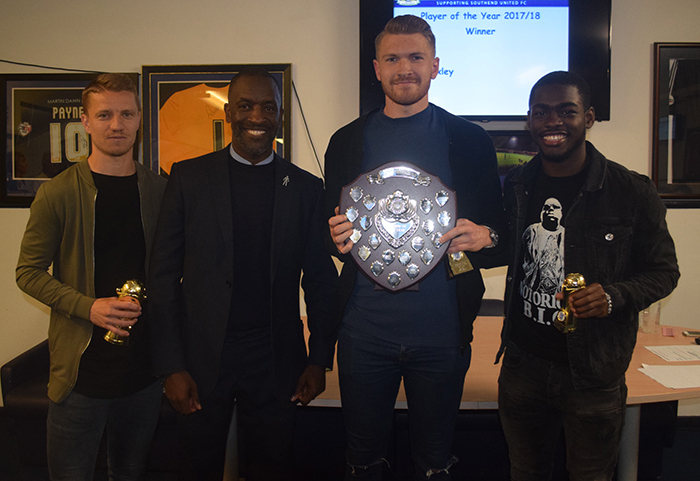 It was standing room only as The Shrimpers Trust held their 2017/18 Player of the Year Awards on 30th April in the Shrimpers Bar at Roots Hall. Trust and Junior Blues members were joined on the night by Chris Powell and his management team plus the Southend United first-team squad. Youth team coach Dave Huzzey and his Under-18s squad were also in attendance. The evening included a number of presentations made to members of both the first and youth teams, culminating in the Trust's 2017/18 Goal of the Season and Player of the Year awards. The evening was hosted by Trust Vice-Chairman Paul Yeomanson, who got the evening underway by announcing the winner of the Trust's April Player of the Month. Dru Yearwood collected the trophy, which was presented by Junior Blues Member Oscar Field. It was then on to the main awards of the evening starting with the Youth Team Player of the Year. 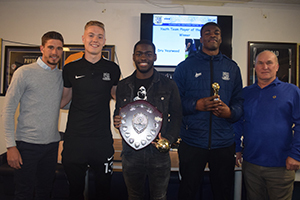 Dru Yearwood was the worthy recipient of the Tom Grace Memorial Shield, which is presented each season to the Youth Team Player of the Year in memory of Tom Grace an avid Southend United supporter and a junior member of the Trust who sadly passed away at the age of 15 in July 2007. Tom's family were guests of the Trust and his father, Len, helped Dave Huzzey present the awards. Runners-up for this award were Nathan Bishop and Emile Acquah. Dave Huzzey was invited to say a few words and he thanked the Shrimpers Trust members for their financial backing to the Academy again this term. Huzzey spoke of another fine campaign for the Under-18s, who are currently sitting in fifth position in the Merit League, which will be their best-ever finish, and how pleasing it was to see so many of his squad step up to the Under-23s and then the first-team. The most recent two first-team squads had each featured eight former Academy players, with 12 Academy graduates having appeared for the first-team during the course of the campaign. Dave said that the main aim of the Academy was to produce players capable of playing first-team football for Southend United, and with the likes of Dru, Elvis Bwomomo, Harry Kyprianou and Lewis Gard stepping-up this had been achieved. Next up were the Top Traveller Awards. For the 2017/18 season the Trust had again run coaches to all away league and cup fixtures, taking in 28 matches – two of which were postponed at short notice, and having covered some 9,816 miles. 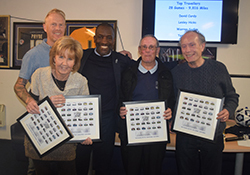 Chris Powell was asked to present the awards to David Cardy, Lesley Hicks, Warren Sadler and Terry Slater, the four supporters who had travelled with the Trust to all these matches. The top Junior Blues Traveller, Callum Turp (6,652 miles), also received his award from Chris. A thank-you was extended by Paul Yeomanson to Lesley for once again organizing the Away Travel for this season and to all supporters who had travelled with the Trust. He added that we looked forward to welcoming everyone back next season. 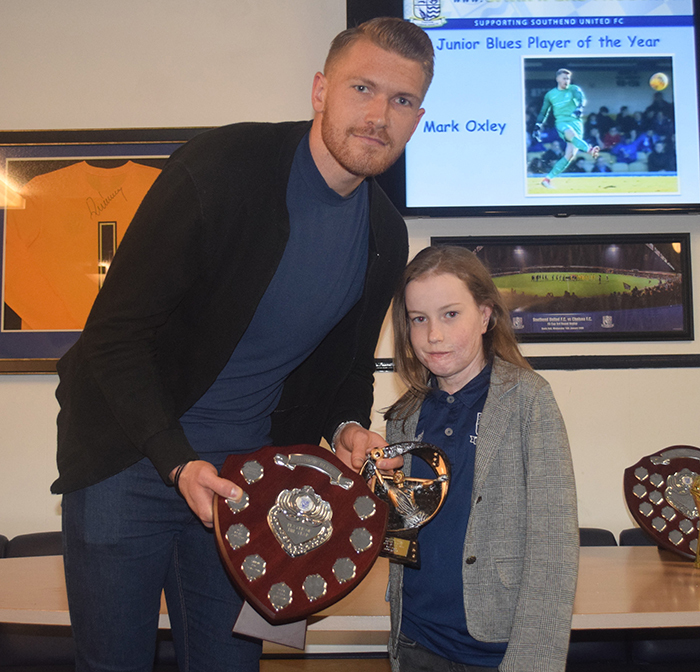 The next presentation was the Junior Blues Player of the Year, which is voted for by Junior Blues members and was presented to Southend United goalkeeper Mark Oxley by Junior Blues member Millie Field. Millie had been selected at random from entries received to present the award. It was then on to The Martin Cranmer Goal of the Season, named in memory of lifelong Southend United supporter Martin, who had passed away at the start of the 2010/11 season aged 40. The award was presented by his wife Zoe Cranmer. A video of the contenders for this award as voted by Trust members was shown featuring the goals from Stephen McLaughlin, MK Dons (A) on 21st November, Michael Kightly, Scunthorpe (H) on 27th January, Marc-Antoine Fortuné, Wigan (H) on10th February and Theo Robinson, MK Dons (H) on 21st April. Midfielder Stephen McLaughlin was confirmed as winner for his goal vs MK Dons. There was then a short break in the proceedings whilst an auction of a signed first-team shirt and football took place which raised £125 for trust funds. The raffle was also drawn at this time raising a further £114. It was then time for the final award of the season, the Shrimpers Trust First Team Player of the Year. Video clips of the five nominated players - Simon Cox, Jason Demetriou, Mark Oxley, John White and Dru Yearwood - had been shown throughout the evening and manager Chris Powell was invited to present the award. Second Runner-Up went to midfielder Dru Yearwood, who added the trophy to the Youth Team Player of the Year silverware he had claimed earlier in the evening. First Runner-Up was defender Jason Demetriou, who has become a firm favourite with fans for his marauding runs down the right flank and his goalscoring prowess from defence. 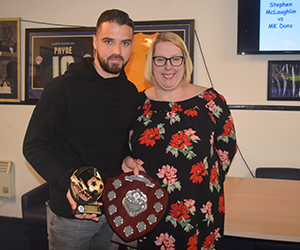 Blues goalkeeper Mark Oxley was voted by Trust members as their Player of the Season for 2017/18, with Mark proving to be a very popular winner, having also won the Junior Blues Player of the Year earlier in the evening. A montage of Mark's saves during the season drew gasps from the gathering and the former Hibernian custodian thanked all those supporters that had voted for him. Chris Powell on behalf of his management team and the players took the opportunity to thank supporters for their continued support over the last season giving special mention the all those that travel to away games. He also acknowledged the work the Trust does for the Academy which is now paying dividends with the number of players now appearing in the first-team squad. Chris was keen to pass credit to the way that the players had responded since he arrived to reach his target of 60 points for the season, and the work that his backroom staff have played since January. The evening was wrapped up by Paul Yeomanson with thanks to Chris, Dave and the rest of the management team plus all the players for taking the time to attend the evening. Thanks were also given to Trust and Junior Blues members who had attended on the night and to the various people who had helped organise the evening. A full set of pictures from the evening can be found on the Trust's Facebook page by clicking here.